Netflix, Youtube, Amazon Prime, Hulu - great ways to watch whatever suits your fancy. But, as with anything, one must proceed with caution. Especially if your spelling is off. Even a little off. So there we were: a few sisters, a cluster of kids, my mom, and maybe a dad or two. And as the topic of "weird children's programming" came up, Teletubbies obviously came to mind. 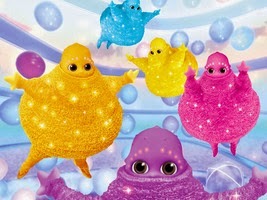 Anyone remember Boohbah? Aired about 10 years ago... and how our now pre-teenish kids LOVED it? And to keep them entertained as toddlers, Boohbah worked better than lollipops. Better than letting them dump out our purses. Even better than toilet water adventures. But here is where things went wrong, very wrong. My sister Sheila decided to do a search - a Boohbah search - to see if the show still held enough magic to captivate our two-year-old niece. Only she left out the very important H after the double O: "B-O-O-B..." And lo and behold, there "it"... uh hem, "they" were. Now, far be it from me to be the family prude, but my protect-everyone-within-reach instinct - the kids, the husbands, my very own mother! - immediately kicked in, and I became the latest and greatest Octamom. My arms and legs quickly shot out; arms and legs I didn't even know I had! After all, this mom had some serious eyes to cover! Whew, what a close one! But I think my attempts really worked. No burning eyeballs. No strange follow-up questions to answer later that day. I was lightening fast! Me protecting my kids... does it ever end? Do I really know what I'm doing? Can I catch everything? Am I bad if I get lazy? Am I bad if I over-protect? Will I always have ninja speed? And last I checked, 2 Thessalonians 3:3, "But the Lord is faithful; he will strengthen you and guard you from the evil one," doesn't include "but only with the help of your mom, of course, and as long as you're a good speller." How to Handle "That One Kid"